All sorts of good, bad, and ugly news came out of the San Diego Comic Con this past weekend. So much news that it’s actually taking me a while to work my way through all the blogs out there. 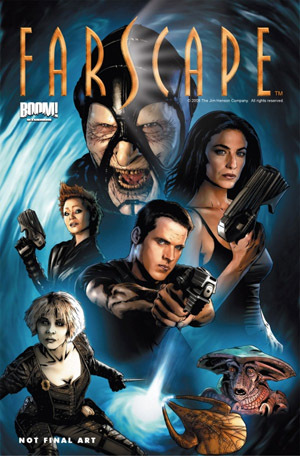 But I have to say, the one piece of news that jumped right out at me and put an immediate smile on my face was word that Rockne O’Bannon — creator of the grossly underrated and prematurely cancelled show Farscape — is in the process of creating a canon comic book that will pick up where the “Peacekeeper Wars” TV miniseries left off. As a fan of Buffy Season 8 and Angel: After the Fall, I’m thrilled when sci-fi shows like this that meet untimely ends get a chance to live on. I can’t wait to see what Crichton and the gang have been up to. Obviously, I’d much prefer to see more episodes of Farscape on television, but since that’s not going to happen, then this is the next best thing. After all, it’s not like I’m not already reading comic books anyway! Hooray!!!! I miss my Farscape something fierce.